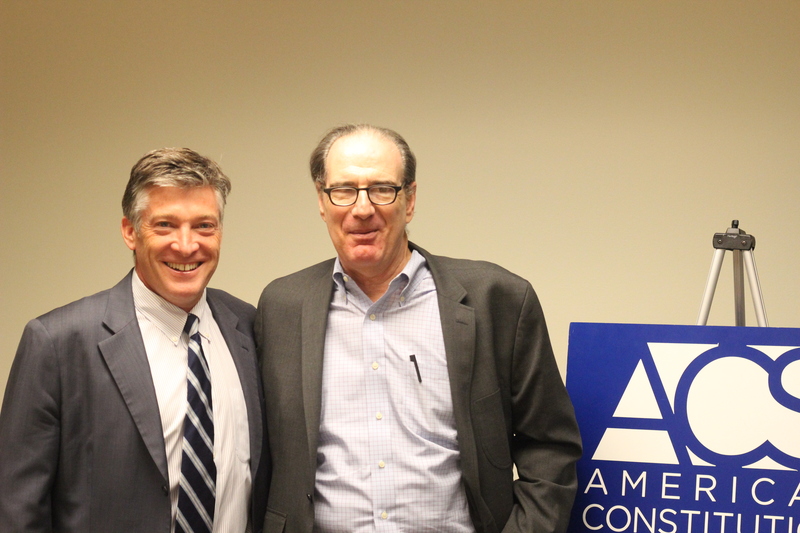 Visiting with the American Constitution Society in San Francisco recently, I talked about the rationale for the 28th Amendment campaign, the progress of the Democracy For All Amendment, among other things. Here’s my talk with links. Thank you to Altshuler Berzon for hosting today. Our Legal Director Ron Fein worked here while in Law School at Stanford and he has asked me to pass on his best wishes. I also want especially to thank Steve Mayer and his team at Arnold & Porter, who are serving along with Ron as Free Speech For People’s counsel in the California 28th Amendment ballot measure litigation, which I’ll talk more about today. They wrote a terrific brief, which is available here in the room and on our website. Steve did this pro bono, and it is the kind of generous support, participation and hard work that I keep seeing all over the country, and which makes me absolutely sure that Citizens United will be overturned before long. Overturning Citizens United and renewing our democracy is what our work at Free Speech For People and our many allies is all about and has been about these past five years. Our objective is clear: Restore the promise of equal citizenship, equal representation, fair elections and accountable government under the Constitution. Our strategy also is clear: We work in the courts, as we are doing here in California, but we also know this is a problem for all Americans, not only we lawyers and judges. Our work for the 28th amendment to the Constitution to overturn Citizens United brings Americans of all political viewpoints together to work in their communities, counties, states and ultimately Washington to not only win this Amendment, but to win fundamental reform across the board to make our democracy and self-government work for a new century. This will not be easy; but it is necessary. Today I’ll offer some thoughts on why this is the case, how the campaign is going here in California and across the country, and what comes next. A constitutional Amendment to reverse Citizens United is necessary, even as many other reforms- from disclosure, to public funding and many more- are well overdue. All of those statutory reforms, while important, cannot fix what is wrong with American democracy if we leave the Constitutional doctrine of Citizens United standing. That’s because when I refer to “Citizens United,” I mean not only the 2010 Supreme Court decision that reversed long-standing precedent and struck down the Bipartisan Campaign Reform Act’s limitations on corporate and union spending in elections. I do mean that; but I also mean what most Americans mean when they demand a Constitutional amendment to overturn Citizens United. (1) the first is recognition in First Amendment jurisprudence of the danger of systemic corruption from unchecked concentrations of power, money and privilege in the politics. (2) The second is the basic political equality of every American, regardless of economic status, and our right and duty to secure that political equality in our election process. Under Citizens United, both of these basic principles now are deemed illegitimate. 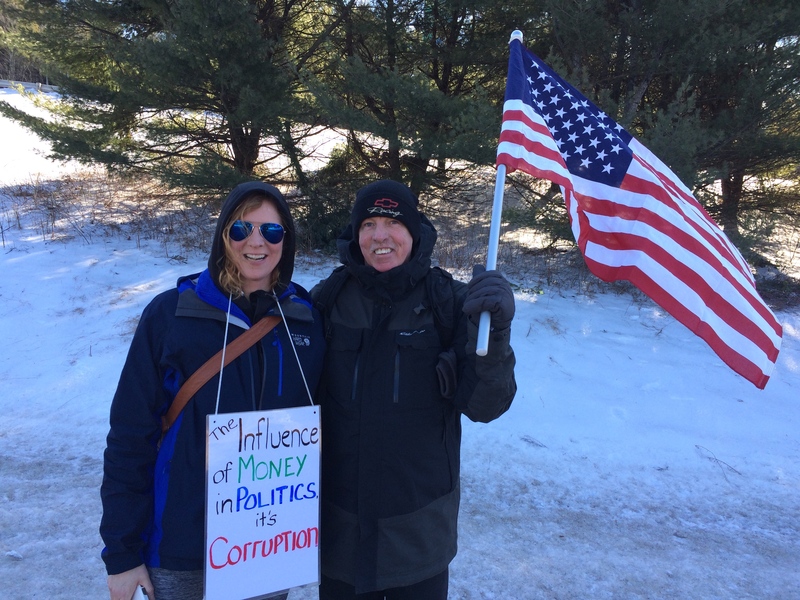 The Citizens United majority declares that corruption does not mean what it used to mean in America- systemic corruption of our elections and our government by unchecked concentrations of money and corporate power- what James Madison called faction. Now it means only the most narrow, quid pro quo, bribery kind of corruption, and only that can justify campaign spending limits after Citizens United. Nor, in the Citizens United world, can election spending and lobbying laws be based on the truth that we are all created equal and are entitled to equal representation. Citizens United denies this, too. Instead, the very wealthy are more equal, have more representation, more of what Justice Kennedy calls “access” and “ingratiation.” (Citizens United, 130 S.Ct. at 910: “access and ingratiation are not corruption.”) After Citizens United, that kind of inequality not only is deemed acceptable, it is decreed as mandatory. So by Citizens United, I mean more than the specific holding of that particular decision. Five years later, the 5-4 majority has made crystal clear the ambitious scope of the overall Citizens United project goes beyond that. In Western Tradition Partnership v. Bullock, they stripped the States and people in the states of the longstanding power to separate corporate money from state and local elections, striking down a 1912 Montana law that had banned corporate money in elections for a century. In the Arizona Free Enterprise PAC case, they struck down state public funding laws that sought to create matching mechanisms to address the unlimited spending unleashed by Citizens United. And in McCutcheon v. Federal Election Commission, they struck down the law that had limited wealthy people to $123,000 in aggregate annual, federal campaign contributions, a limit– bear in mind– that was three times larger than the total annual wage of 100 million Americans. …Contribution limits may not be upheld as a means of limiting disparities in the extent to which people of different economic backgrounds are able to participate in the political process and exercise their First Amendment rights. That assertion is a correct statement of the law after Citizens United. But it is a statement that is repugnant to our Constitution and to the hope of the world. Does one very rich person now have far more political influence and much more representation than one poor person; and even much more representation than thousands or even millions of poor and middle class people? That cannot seriously be disputed. Do global corporations now have far more political representation and power in federal, state, and local governments than the people, the constituents, who once were thought to be the source of all the powers of those governments? Of course they do. Almost all Americans now are completely excluded from what is a systemic “wealth primary”- in the words of John Bonifaz, co-founder of Free Speech For People. A wealth primary that decides the issues, the candidates, and what debate is permissible, and what is not, long before Americans are asked for our opinion or vote. Only 4% of Americans participate in the political money game in any way at all. Only ½ of 1%– that is, 0.5% — contribute over $200 to a campaign. But that money from ½ of 1% makes up most of the total contributions and spending. IN 2012, 32 Super PAC donors– 32– exceeded all of money that President Obama and Mitt Romney raised from all of their donors who gave $200 or less– that is to say, all of the combined contributions of nearly four million people were exceeded by 32 donors. The 2014 election showed that concentration getting even worse. This rapid consolidation of our political system into the hands of the few is why this is now much more than a debate about case law or campaign finance law; that’s why we face more than the challenge of trying to win a range of local, state or federal statutory reforms that are needed. In fact, we now face what Justice Stephen Breyer calls the “grave question of democratic legitimacy.” We face the question of whether we will preserve the democratic DNA of America or move into oligarchy and plutocracy; whether Citizens United stands or falls; and whether Americans still have what it takes to do what every generation before us has done- to win Constitutional amendments where necessary to preserve democracy, equal citizenship and accountable government. I know we still have what it takes. In fact, we are much closer to winning the 28th Amendment than many people realize. Last summer, the Democracy For All Amendment cleared the United States Senate Judiciary Committee. This Amendment restores the authority of the American people through our Congressional, state and local representatives to enact election spending regulations in order to protect the integrity of elections and the equal rights of Americans to political representation and voting. It also protects our rights to distinguish between corporations and human beings in such laws. Following the Judiciary Committee approval, the Amendment went to the floor of the Senate in September. In a Senate in which filibusters killed most things without a vote, 78 Senators voted to end debate and go to a vote. The Democracy For All Amendment won a vote of 54-44. Of course the Article V amendment approval process for Congress requires a 2/3 vote– 67 Senators and 290 Representatives. So we have a ways to go- but with that kind of vote in the Senate, and 100 co-sponsors in the House, the 28th Amendment is a very real prospect. I say this not only because of the support in Congress. In fact, much more important is the support in the country, because that will determine our success. And that is where we are far stronger than even than the vote in Congress suggests. Since 2010, poll after poll confirms that ¾ of Americans in virtually every region of the country disagree with Citizens United and support a Constitutional amendment to overturn it. Supermajorities of Republicans, Democrats, and Independents oppose Citizens United and support the 28th Amendment. We know that polling is right because over and over again we have tested the proposition at the ballot box in local and state ballot initiatives, and in local and state legislatures and city councils. More than 600 cities, towns and counties have enacted resolutions condemning Citizens United and calling for the 28th amendment. In open town meetings, or local ballot measures, these resolutions often pass by levels of 65-75%. 47 New Hampshire town meetings in just one week last Spring, and the same thing is happening across the country. People have won cross-partisan amendment resolutions in Brecksville, Ohio and New York City; Teton County, Idaho and Chicago; Savannah, Georgia and Boston; Springfield, Missouri and Portland, Maine; Charleston, West Virginia and Los Angeles, and hundreds more. 40 more cities and towns did this just on this past November election day alone. Three years ago when I wrote the first edition of Corporations Are Not People, one state had enacted a 28th Amendment resolution. Now, in the space of 36 months, sixteen states have passed amendment resolutions. Two of these, Montana and Colorado, did so by statewide ballot measures that passed 75%-25%. So this is the context to consider the California ballot measure, Prop 49, and the case now pending in your Supreme Court about its decision to strip the proposition from the November 2014 ballot. California has been quite active in opposing Citizens United and all that it stands for. Your legislature actually first enacted an Amendment resolution in 2012. Then last summer, the legislature passed the Overturn Citizens United Act. This statute adopted the policy of California to be in opposition to Citizens United, setting out that unlimited money in elections can be regulated and that corporations do not have the Constitutional rights of people. The statute then authorized a statewide ballot measure for November 2014 to allow California citizens to vote on an advisory question about whether Congress should pass and California should ratify a Constitutional amendment to overturn Citizens United. When the Overturn Citizens United Act passed last summer, The Howard Jarvis Taxpayers Assoc. filed a lawsuit to block the ballot measure. They argued that the Legislature lacked authority to place such a measure on the ballot. On a preliminary basis, with no oral argument and little briefing, the California Supreme Court rather hastily agreed, and ordered the Secretary of State not to proceed with the measure. The matter is now before the court, more fully briefed, and a decision on the merits is expected in due course. For the reasons set out in our brief and others, I think the Court made a very bad misstep and should not have denied the right of California people to be heard on this, and the right of your elected branches of government to seek and obtain the advice of their constituents in this matter. But as a Massachusetts lawyer, I’ll leave that question of California law to the Court and to our outstanding California counsel. I will say, however, that I think in acting hastily, the Court deprived itself of relevant facts, meaningful history, and a better understanding of the stakes and the historical moment that is now building around the country and in California. Justice Gordon Liu, for example, is well known to us and well-respected by all of us in the American Constitution Society. But it is hard to understand why he would go out of his way, as he did in a concurring opinion on the stay order, to trivialize the issue, suggesting that if the Legislators wanted the views of their constituents, they could commission an opinion poll. Apart from the absence of any reason why, if an opinion poll is within the authority of the Legislature, a ballot measure is not, the comment strikes one as gratuitous and out of touch with the reasons the Overturn Citizens United Act passed in the first place. By now, many California people are getting impatient, and want to join, reassert, amplify, and give teeth to the legislature’s 2012 call for the 28th Amendment. Led by Money Out Voters In, a volunteer citizens group in California that started up after Citizens United, the Overturn Citizens United Act was introduced to reinforce the call for the Amendment, to give California citizens an opportunity to be heard, and, depending on the outcome of the ballot measure of course, to instruct California’s state and federal legislators to act to move the Amendment to ratification. When the ballot measure bill was pending in the legislature last Spring, California people sent more than 176,000 faxes to the legislature; they delivered a petition with 55,000 signatures. They sent 40,000 emails. Hundreds of Californians traveled to Sacramento to visit their legislators and urge passage. And last June, more than 300 people marched on the capitol to demand that the Legislature take action to let the people speak and to move the 28th Amendment forward. Many of these people had walked more than 400 miles from Los Angeles on a march for democracy organized by another new citizens group called 99Rise. Several people were arrested after refusing to leave the Capitol until the Legislature acted. I offer this detail because I think Justice Liu and perhaps others on the Court, at least subconsciously, had a misconception that all of this is just a wonky campaign finance issue, or talk of the Amendment is somehow pie in the sky or political games and not serious. To the extent that point of view had traction five years ago, it is embarrassingly out of date now. Americans take this very seriously. They don’t march 400 miles in the heat of a California June or, as they did last month, in the cold of a New Hampshire January, for wonkiness or pie in the sky or political games. They do it because they take this seriously as Americans, and they take it personally. They know, I believe, that this Amendment effort raises the recurring core American question of political equality and equal representation; about taking back something that has been taken away; and about our self-respect as equal citizens in a republic. So this is the context of the California ballot measure about Citizens United and the reasons why the 28th Amendment campaign has gained such strength. And I hope very much that California will not be the first, and perhaps the only, State in which the courts deprive the people of a right to vote and be heard on this question. Constitutional amendments are difficult by design- As Madison wrote, the amendment procedure must be available but should be used only on extraordinary occasions. Five years of Citizens United and its consequences clearly herald an extraordinary occasion. In response, the Amendment campaign is getting stronger and more insistent. We’ve made far more progress than many would have believed possible five years ago. But we recognize that while we may be half way there, the next phase will be even more challenging. As the litigation against Prop 49 shows, we will face more organized and well-funded opposition. We will need to convince Republicans in Washington to do what their constituents back home repeatedly demonstrate they want done and to join this work to reverse Citizens United and enact fundamental and substantial reform. But we have a good plan, great people, and a right cause. In the coming months, I think you’ll be seeing more about the next phase, including new national components and new state and local components. We will be in targeted states and localities and most importantly we will be empowering and supporting Americans in every community to join the millions who have taken a stand and taken action so far. In doing so, we will hold and strengthen the cross-partisan super majority on this that has held for five years amidst the most divisive partisan environment, and we will seek to spread this cross-partisan model of Americans willing to do together what is best for the country, regardless of their political differences—we will spread that even to Washington. Over the next two or three years, we will see many hundreds if not thousands more communities debating and enacting Amendment resolutions; several more states will join the first 16 with state Amendment resolutions; and an Amendment caucus will develop among Republicans in Congress that will work with the virtually unanimous Amendment caucus of the Democrats and Independents in the House and Senate. We will continue to focus on the 28th Amendment because this fight over Citizens United is the fight for the promise of the American Revolution, the promise of our Constitution, and the promise of humanity that we are all created equal and that democracy can flourish. And that promise is too important to leave to lawyers and judges alone.